Though usually found singly or in pairs, Bateleurs can sometimes be seen perched in large groups of more than 20 individuals. Juvenile Bateleurs have longer tail and wing feathers than their parents. Young eagles need these longer feathers when they are first learning to fly, as they give them more stability and control in the air. Each year, as the bird molts, its new feathers grow in a little shorter. When the bird reaches maturity, it will have the long, narrow wing and short tail of an adult, which readily distinguish Bateleurs from all other African raptors in flight. In Kenya, our scientists are working hard to learn about and protect all raptors and their habitats. Through environmental education efforts, they also are working to put a stop to the common practice of poisoning carcasses to kill large predators, which also kills a host of wildlife including vultures, eagles, and other scavenging birds. These efforts will certainly benefit all raptors of the region, including the Bateleur. The Bateleur is widely distributed in Africa, the world's second largest continent. 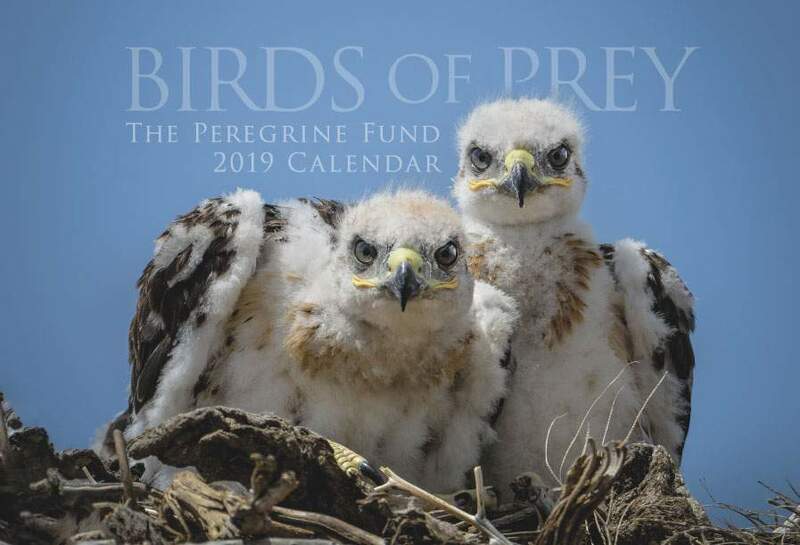 Though this medium-sized, colorful eagle is absent from the northern deserts of the continent, it is fairly widespread south of the Sahara Desert and can be found all the way into South Africa, west to Cameroon, and east into southwest Arabia. 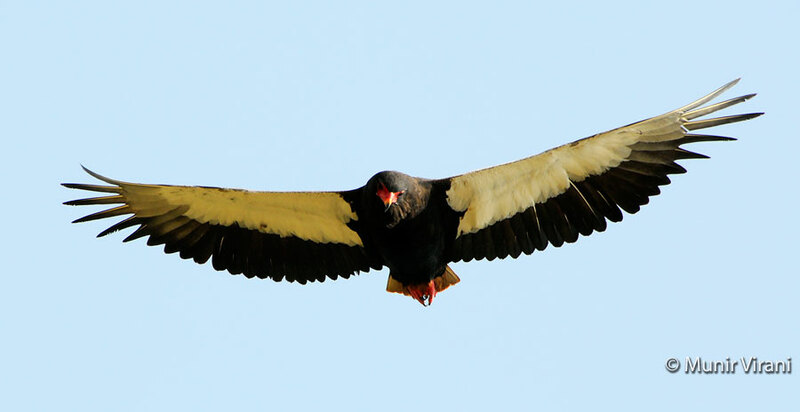 Unlike many eagle species, however, the Bateleur is not found in areas of dense forest. This highly adapted hunter is an eagle of the plains and prefers open habitat such as woodland savannas and grasslands where it can easily be seen soaring at unusually low heights in search of prey, nesting in tall trees, or perching in snags. Its red face, chestnut-colored back and tail, intense black body, silver wings above and brilliant white below, and red legs make the Bateleur one of the most colorful eagles in the world. It also has the shortest tail and narrowest wing, relative to its body size, of any eagle, an adaptation to low altitude soaring flight. This is very helpful for birdwatchers, as it makes identifying this eagle relatively easy, even when it is far and high in the sky. Another easy way to identify this bird is by watching how it flies. Bateleurs actually fly in a very unique way. When soaring, they rock their wings from side to side, almost as if they were constantly trying to regain their balance. But rest assured, these raptors are masters of gliding flight. In fact, Bateleurs spend quite a lot of time in the air soaring over great distances, sometimes more than 125 miles, in search of food. The Bateleur is a diurnal raptor, which means it actively hunts, flies and otherwise goes about its business during daylight hours and rests, or roosts, at night. 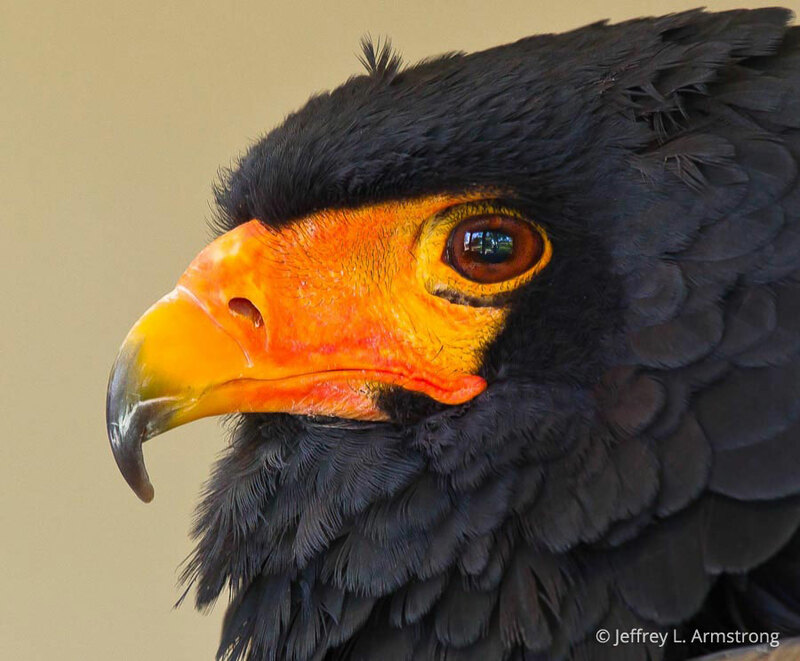 Perhaps more than any other eagle, the Bateleur is not very good at hiding its moods. Like a mood ring that changes colors depending on how the wearer of the ring feels, the skin on this raptor’s face and legs changes colors, too. When a Bateleur is calm and relaxed, its skin is generally a pale red, sometimes more orange color. However, when it gets excited, its legs and feet can quickly turn bright red. These birds also raise their crest and puff up their chest feathers and spread their wings to show their agitation. And when the occasion calls for it, this normally quiet bird will emit loud raspy "barks" unlike anything heard from any other eagle! Sadly, Bateleurs are suffering the same fate as so many other wildlife species. Their range is shrinking in many areas due, in large part, to habitat loss. Even where habitat remains, these beautiful eagles are also being poisoned! Ranchers will often lace a dead cow, sheep or other bait with highly toxic poisons in an attempt to kill jackals, lions, hyenas and other predators that they fear might prey on their livestock. Because Bateleurs scavenge on carcasses, many of them die after ingesting these poisons, which are also responsible for the deaths of many other animals including vultures and storks. If this weren't bad enough, scientists have documented that some of these eagles end up accidentally drowning in farm reservoirs, too. Recent studies suggest that as long as individual Bateleurs remain in protected areas, such as national parks, they will do okay. But, as soon as they leave the boundaries of the park – remember, birds don’t recognize such things as country borders or park boundaries – they become vulnerable to poisoning. In some countries, people are even trapping or poisoning these birds in order to collect their feathers and other body parts, which are sometimes used in superstitious rituals. Clearly, this majestic eagle is in need of protection and could use our help now more than ever. The Bateleur has a long list of items on its menu because it typically scavenges dead animals, including road-killed animals like birds, lizards, and small mammals. It also hunts small vertebrates, especially snakes, as well as mammals and birds, including doves, hornbills, and kingfishers. Bateleurs have also been observed feeding on insects such as termites and the occasional fish. They are also known to scavenge on large carcasses, which can be an important food source for young birds just learning to hunt on their own. In fact, these “easy meals” might make the difference in whether a young bird survives or not, as life for a young raptor can be challenging indeed. Though Bateleurs have adapted wonderfully to successfully hunt a wide variety of prey – for example, their legs and feet are covered with thick and course skin, which scientists think is an adaptation to help protect against snake bites – they are also vulnerable, especially when hunting medium-sized mammals. One scientist witnessed a Bateleur trying to hunt a Honey Badger. The badger fought hard to defend itself and both animals ended up dying in the struggle! Among the long list of scavenging birds in Africa, including vultures, Bateleurs are almost always the first to arrive at a fresh carcass because of their ability to soar at low altitude. 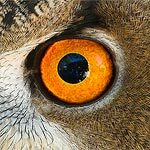 They take advantage of their position to feed quickly on the tastiest morsels first, including the much sought-after eyes. After other scavenging birds arrive, the Bateleur takes on a more submissive role, letting other scavengers feed first and often leaving the scene to search for something else long before the carcass is finished. This species sometimes engages in piracy, meaning it steals the food right out of another bird's talons, so to speak. In reality, it just harasses the other bird until it drops its catch. More often than not, however, other eagle species, like the Tawny Eagle, steal from the Bateleur unless it can out-fly the pirate in a spectacular game of chase. A pair of Bateleurs often builds a nest of sticks and twigs in the fork of a tall tree, usually below the canopy, and along rivers or other watercourses. Like the Ridgway's Hawk, they will sometimes even build their nests right on top of another bird's nest! Though scientists have observed that Bateleur nests seem quite small compared to the size of the bird, these eagles do just fine. Usually between January and March – the onset of the rainy season in some countries such as South Africa and Zimbabwe – the female lays one white, unmarked egg. Both parents take turns keeping the egg warm and safe over a period of almost two months. After the chick hatches, the male and the female share parenting duties by protecting the young chick and bringing it food. After about three or four months, the young bird is ready to fly for the first time, though it will be reliant on its parents for at least another four months. Bateleurs develop their adult plumage at about 5-6 years of age. At this time, they are ready to find a mate and begin their own families. Bateleurs may mate for life. 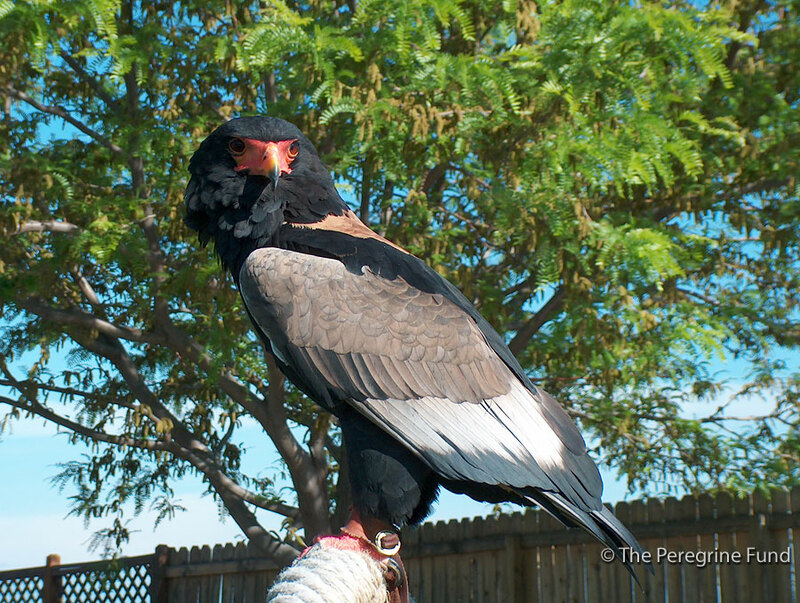 A visit to the World Center for Birds of Prey will reward you with a close-up look at the beautiful Bateleur. On display in an outdoor aviary, Stoffel delights visitors with his colorful plumage and entertaining behavior. 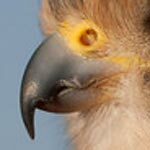 Our experts and volunteers at the visitor center will help you learn more about the interesting traits, feeding habits, and reproductive behavior of this unusual eagle.